“During the project with Vivo D'Arte, what I did, not just in the show, but in my career mattered to them. The high quality performance opportunities Vivo D'Arte has given me and the continual backing of many of the inspirational people involved have been invaluable." 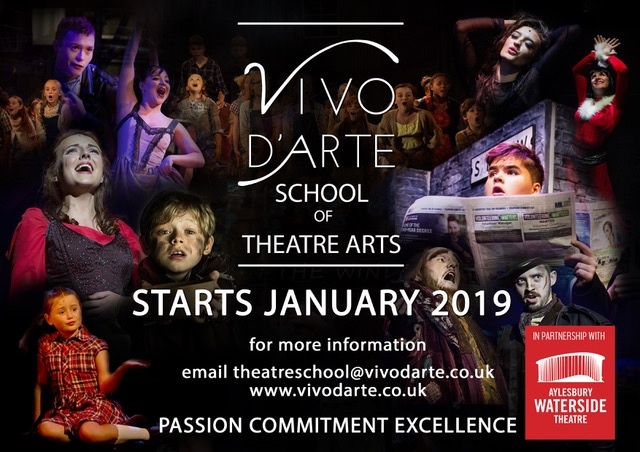 We are thrilled to announce the new Vivo D’Arte School of Theatre Arts in partnership with Aylesbury ATG Waterside Theatre in the new year. In contrast to many traditional stage and theatre schools we propose a different, and we believe, uniquely exciting approach to theatre arts training. From the moment you begin the process with us at Vivo D’Arte, whether you are brand new or an experienced performer already, you will quickly realise that we work differently, and the set-up we have created closely emulates the realities of working within the theatre arts industry. The school’s aim is not only to provide the highest quality training in the musical theatre acting disciplines, but also, to familiarise our performers with the workings, structure and professionalism required to work in a theatre company. This will be done through an exciting and interesting programme relevant to all ages, where everyone will have lots of fun and make friends along the way too! Our dedicated and experienced team of staff are also arranged with this theatre-based model in mind: Artistic Director, Resident Choreographer, Musical Director, Company Manager, Technical Support, etc. Partnering with the ATG Aylesbury Waterside Theatre and having this as our regular rehearsal and performance space is a fantastic benefit to us as a company and for our performers. It is a multi award-winning theatre with beautiful, contemporary and invigorating spaces to use, whilst working alongside their hugely supportive management, administrative and front of house team of staff. Aside from the obvious benefits of being located within a large regional theatre, our partnership also includes exclusive member-access to a long list of theatre and performance-based opportunities including: live performances for local large-scale events, well-known festivals and fêtes, seasonal launches, galas and parades (e.g. Whizzfest, Live in the Park, Christmas Celebrations), meeting with industry-professionals and cast members, film and radio opportunities etc.